Wellington, Alexander Turnbull Library, MSR-28, formerly MS Papers 1620 (Margaret M. Manion, Vera F. Vines, and Christopher de Hamel, Medieval and Renaissance Manuscripts in New Zealand Collections (Melbourne, London and New York: Thames and Hudson, 1989), no. 158); rental of the Italian abbey of San Gregorio, Rimini, Italy, c.1487. 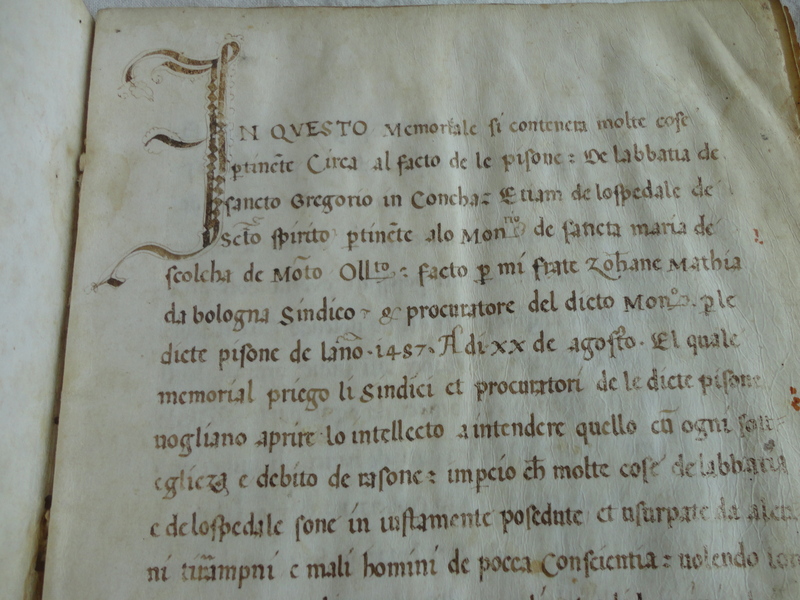 This is a twelve-page memorandum dated 22 August 1487, written in a beautiful italic hand by a Brother John Matthias of Bologna. It concerns the repossession of land because of unpaid rent or the absence of direct heirs. The book comprises three parchment bifolia. 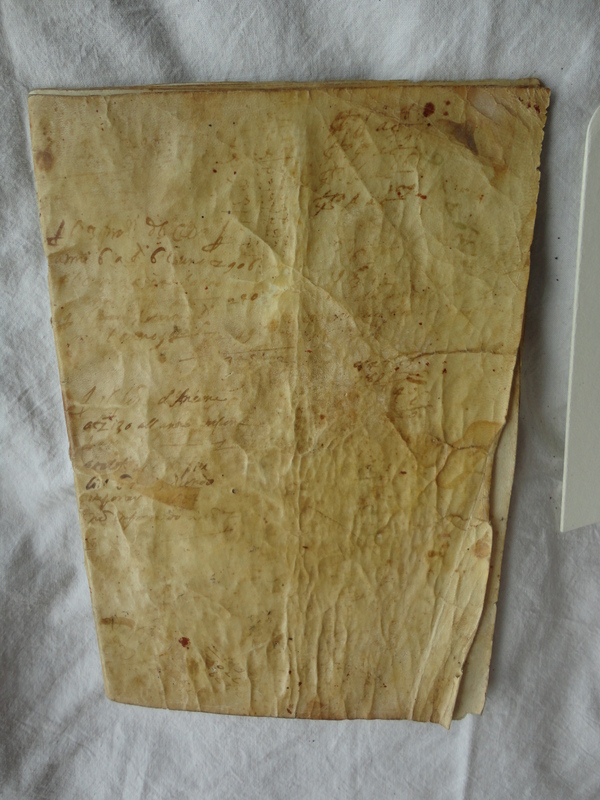 Each of these has been attached individually to the parchment cover by long stitches (see the discussion of Auckland Libraries, Sir George Grey Special Collections, Med. MS G.127 and Alexander Turnbull Library MSR-03, in our Script & Print articles, pp. 202-7). There is some evidence—extra holes in the fold that serves as “spine” of the book—to suggest that the stitching that is visible now is not original, though it does seem that a similar kind of archival sewing technique has been replicated in the later repair/resewing. The binding could of course be later than the document itself, but not much later: to survive in such a good condition, the six folios would always have needed some protection. There is evidence that the materials used for compiling this little book were prepared as for a “ledger”: that is, the leaves and the cover have been folded at the centre (to allow for book-keeping uses) though the rental itself is single column. The outer face of the cover has been used for calculations over the years. Manion, Vines, and de Hamel identify the arms of the Olivetan (Benedictine) order, roughly drawn on the outside of the upper cover. Additionally, a set of concentric circles have been scored into the parchment of the inner face of the upper cover. We cannot account for this, but have seen it on similarly bound books elsewhere, for example, Westminster Abbey MS 34/5, an Oxford student’s notebook, also limp bound, also from the last quarter of the fifteenth century. There is only limited literature on archival or “stationery” bindings on small documents of this kind, almost all of it by conservationists. Such bindings must have been a very common way for people to encounter textual material in the Middle Ages. Texts-in-progress and short texts that had yet to find their way into larger miscellanies probably began their lives as just such simply-bound manuscript “booklets”. J. A. Szirmai, The Archaeology of Medieval Bookbinding (Farnham: Ashgate, 1999), 309-11, discusses ledger bindings in detail, but this term describes a particular species of archival binding not seen here. For useful examples from the same period as this book, see Holly Robertson, “Spanish Archival Bindings, 1300-1800,” accessed 1 June 2012, http://www.ischool.utexas.edu/~hollyr/portfolio/spain/archival-bindings/2004-16.html#se. Pamela R. Robinson, ‘The ‘Booklet’: A Self-Contained Unit in Composite Manuscripts’, Codicologica 3 (1980), 46–69; Alexandra Gillespie, “Medieval Books, Their Booklets, and Booklet Theory,” English Manuscript Studies 16 (2011), 1-29.